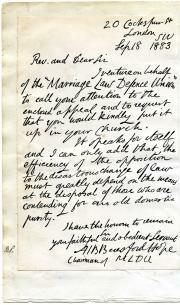 [Eleanor Rathbone; women's rights] Autograph Letter Signed to indecipherable name ("L.A.C." initials at the end of the accompanying typescript text of an "interview" with Rathbone, title "Women of Merseyside", with her annotations and corrections. [Letter; printed heading] Oakfield, Penny Lane, Liverpool, no date; [Typescript] no date. Letter, 2pp., 12mo, some aging and a fold mark, but mainly good; Typescript, 6pp., 4to, fold mark, good condition. In the letter she writes, in a hurried difficult hand, that she has made a "few corrections" and thinks the author/interviewer has done her best to give interest with sparse material. She concludes "Don't let them cut out the bit about the Local Gov. [Franchises?]" which she thinks the most "new & interesting". 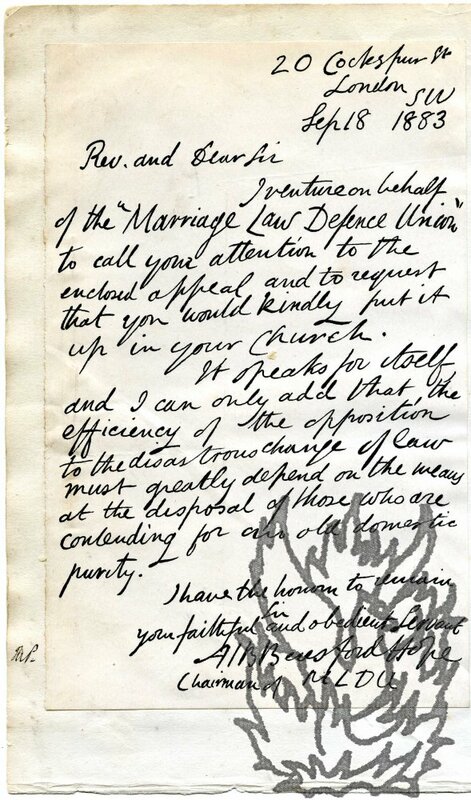 Printed facsimile of circular letter to clergymen from 'A J B Beresford-Hope', as Chairman of the Marriage Law Defence Union', writing in opposition to the Married Women's Property Rights Act of 1882. 18 September 1883. 20 Cockspur Street, London SW. The signatures of the above. Piece of paper, laid down on detached album leaf, c.4" x 3", with signatures only of Nancy Astor and Margaret Wintringham, the first and second women MPs, withe note giving that information. 21 October 1858, no place. Historian (1796-1874), whose most famous work was "The Lives of the Queens of England". One page, 12mo, on blue paper. "Believe me to be, dear Miss Georgina Jones very truly / Agnes Strickland / Octr. 21 1858". Unobtrusive numbering in one corner.